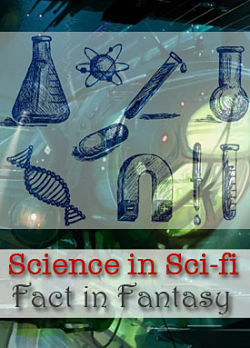 Science in Sci-Fi, Fact in Fantasy is a blog series for authors and fans of speculative fiction. Just as science fiction often has roots in hard sciences — physics, astronomy, genetic engineering, microbiology — fantasy world-building relies on everything from economics to military strategy to animal husbandry. Each week, we discuss elements of sci-fi or fantasy with an expert in a relevant topic area. We debunk the myths, correct the misconceptions, and offer advice on getting the details right. You’ll find most of the experts on this Twitter list. 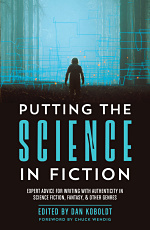 Editing life in science fiction, with microbiologist Mike Hays. Realistic translation in fiction, with archaeologist Marie Brennan. Dementia myths in fiction, part 2 with neurologist Anne Lipton. Writing children with BESD, with special ed teacher Rachel Heaps-Page. Bipolar disorder: What writers should know, with psychiatrist Jon Peeples. Schizophrenia: What writers should know, with psychiatrist Jon Peeples. Autism misconceptions in fiction, with pediatrician Josh Michaels. Binary poisons in fiction, with emergency/toxicology doctor Jane Prosser. Space flight in science fiction, with aviation expert Sylvia Spruck Wrigley. Faster-than-light travel in sci-fi, with physicist Jim Gotaas. Imaging over long distances, with astronomical engineer Judy L. Mohr. Relativity: Did Einstein kill steampunk? with physicist Dan Allen. Practical spaceship design, by Boeing engineer Eric Primm. Exoplanets and habitability, by physicist Jim Gotaas. 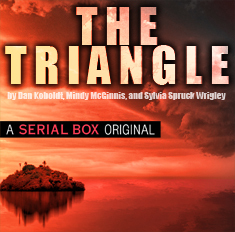 Radio waves for sci-fi authors, with atmospheric physicist Candida Spillard. Distance and legal systems in sci-fi, with “space lawyer” Matthew Reardon. Space law: lowering the cost of space travel, with “space lawyer” Matthew Reardon. How the ocean will kill you, with marine biologist Danna Staaf. Habitable atmospheres for authors, by atmospheric scientist Lynn Forest. Gravity basics for SFF authors, by physicist Dan Allen. The future of energy, by geophysicist Karen Lanning. Earthquakes: Fact vs fiction, by civil engineer Amy Mills. Waste management in SF, with expert Gareth Jones. Enclosed ecosystems and life support, with biomedical scientist Philip Kramer. Computer and internet myths, with computer scientist Matt Perkins. Your sci-fi cell phone isn’t cool enough, with silicon valley consultant Effie Seiberg. CGI is not made by computers, by 3D video game artist Abby Goldsmith. 7 things to know about cybernetics, with neuroscientist Benjamin Kinney. Writing believable nanotechnology, with physicist Dan Allen. Proper lab technique for SFF writers with nuclear chemist Rebecca Enzor. Researchers gone wild, with laboratory manager A. N. Vidrine. How to write convincing death scenes, with science reporter Bianca Nogrady. More medical myths in fiction, with nurse Stephanie Sauvinet. Organogenesis in 3D, with biomedical researcher Megan Chaudhuri. First aid and Field Dressings for Writers with medical expert Stacey Berg. Drug development for writers, with research scientist Bradley Johnson. Here are articles related to culture, animal husbandry, warfare, and other relevant topics for fantasy authors. France as a fantasy culture, by itinerant francophone Dan Koboldt. Female professions of medieval Europe, by Renaissance man Jerry Quinn. Religious fundamentalism in fantasy, by Crusades hobbyist Spencer Ellsworth. Languages in fiction, with linguistic expert Christina Dalcher. Woodworking myths in fiction, by craftsman Dustin Fife. 5 Facts About the American Old West, with historian Hayley Stone. Folklore systems in fantasy, with historian Colleen Halverson. Witchcraft for Writers, with Renaissance historian E.B. Wheeler. Superstition for Writers, with Renaissance historian E.B. Wheeler. A brief history of real-world magic, with historian Jay S. Willis. How to write rock climbing wrong, with longtime climber Michelle Hazen. Matching horses to use, setting, and character, with expert Rachel A. Chaney. Weapons and tactics in fantasy warfare, with veteran/historian Michael Mammay. Realistic fighting for SF/F authors, by martial artist Eric Primm. Building a fantasy army: Leaders, by veteran officer Michael Mammay. Building a fantasy army: Soldiers, by veteran officer Michael Mammay. Here are some of the topics that are relevant but for which I haven’t yet lined up an article. Please feel free to send me your suggestions, and I’ll do my best to find a willing expert. This is not a comprehensive list! If you’re an expert in a topic relative to SF/F and would like to contribute, please check out the contributors information page and then contact me by e-mail, Twitter, or Facebook (in that order of preference). I’m a genetics researcher with a background in biology and computer science. That qualifies me to talk about some of the science in sci-fi, like genetic engineering, cloning, and mutations. I’m a bowhunter, too, which might be useful. We’ll need many other contributors to make this work. If you have experience in science, engineering, medicine, or technology, I’d love to have you contribute. The same goes for people who know about martial arts, animal husbandry, history, or other topics. Please see my Information for Contributors page, and then contact me to discuss.